The �Would you rather�?� party game. Fart every time you kiss someone. Try as hard as you can to hold every handshake for 30 seconds. Be required to steal from every tip jar you see. 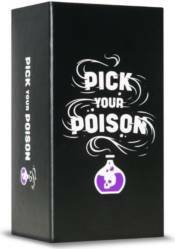 The Judge combines two Poison cards creating a really hard �would you rather�?� scenario. Players anonymously �Pick their poison� and hope the other players agree with them.